We get many questions asked about our company and the services we provide. Below we have listed some of the most popular. What are the benefits of having my oven professionally cleaned? Why have your oven professionally deep cleaned Versus cleaning it your self ? What we have found at Cookerburra is that most people struggle when trying to clean their oven themselves for a variety of reasons. Having your oven professionally deep cleaned, by fully trained and insured technicians/ operators, allows us to take all the above away from you. What is the history of Cookerburra? 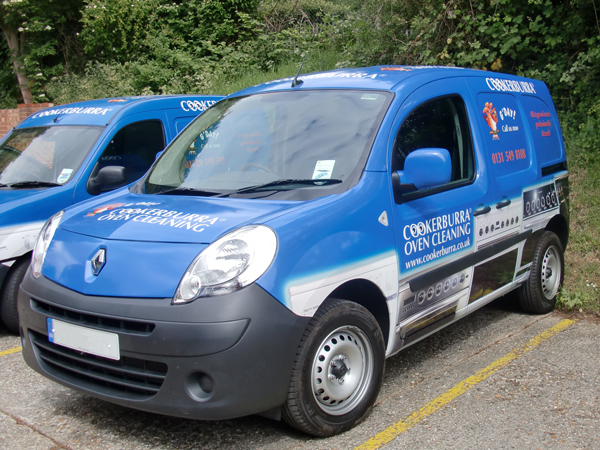 Trading since 1993, Cookerburra was the first oven cleaning company in the UK, and has created an industry in the service sector unto itself. Michael Holloway, one of the founders worked as a chef and realised that as in commercial kitchens where there was a build up of carbon and kitchens sinks were not big enough to accommodate the oven racks and pot supports, that the same applied to people with household ovens. Having seen the gap in the market, he and his fellow business partner David Dymond conducted market research in Reading in the middle of 1993, as to what people would expect from an oven cleaning service, what would they be prepared to pay, how often they would like it cleaned. They cleaned three ovens their first day on October 25th 1993, and such was the demand they had their second van on the road three months later. The original concept was to operate Cookerburra through out the UK, based on a franchise basis where operators can run a tried and tested system based on eight years experience delivering consistent high levels of standards. Cookerburra launched its first Franchise in 2001 and has been expanding ever since. Why do people use Cookerburra? Our customers like to feel secure knowing that all our Franchisees and operators have undergone an intensive three week training course here at Head Office in Reading. Hands on, in field training actually cleaning cookers along with a dismantling procedures manual. Trained in the use of Cookerburra's tried and tested " own brand" cleaning products. Back up and advice from head office as and when needed, from the Directors with nearly twenty years experience. Full Public and products liability insurance. All Cookerburra operators are fully insured with a comprehensive £2,000,000 Public Liability Insurance policy held by one of the UK's, leading Insurance companies. Can Cookerburra clean "Self Cleaning Ovens"? Yes, Cookerburra operators are fully trained to clean self clean ovens and our range of products are specifically designed to cope with all types of ovens. Self cleaning ovens often comprise of self clean interiors and/or liners designed to burn off debris left behind from Cooking. However, many do not reach the high temperature needed to produce the required result. Many Cookerburra customers comment on how difficult it can be to clean such ovens themselves, as these liners "hide" the majority of grease and fat build up. Your local Cookerburra operator will however be able to remove all such fat, grease and carbon deposits and leave your oven sparkling again, particularly in those hard to reach areas around the main element and even the fan. Does Cookerburra clean Agas, Raeburn's, Everhot etc? Yes, we offer the highest standards of cleaning for these types of appliances and pride ourselves on producing outstanding results for these prestigious appliances every time. Other than cleaning ovens , do Cookerburra provide other services? Yes, Cookerburra operators provide a range of other services to other appliances in the domestic kitchen, including the cleaning of standard microwave ovens, combi microwave ovens, extractor fans, canopies and filters and BBQs. Operators also carry a full range replacement oven light bulbs heat resistant to 300C, along with canopy lights and replacement canopy filters. Although we don't carry cooker parts we can put you in contact with a reputable supplier or the manufacturer. Does Cookerburra provide services in other areas such as the commercial market? Yes, alongside the domestic market we provide the oven cleaning service and ancillary services to letting agents, estate agents, pubs and clubs, nursing and residential retirement homes, school home economic labs, university accommodation, catering vans, Armed Forces for march-out, Aga's to name a few. Simply on the "Find My Local Operator" button, input your post code and their contact details will appear. You can also write them a question. Can I run my own oven cleaning franchise? 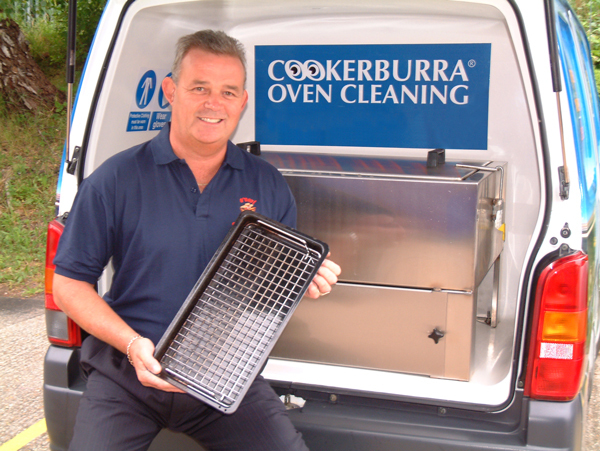 If you are interested in owning your very own Cookerburra oven cleaning franchise then we would first point you to the franchise page on this site. There you will find details about owning a franchise as well as a post code search to see if there is currently an operator in your area.